The bad news is that March is one of those transitional winter-to-spring months when all those fresh and lovely new spring veggies and fruits are not yet available. The good news though is that those tired old standby root vegetables now come in some kicked-up, fantastically tasty heirloom varieties, including the common carrot! That’s why today Linda LaRue, creator of The Core Transformer and author of the SOUPer Slim Diet, makes heirloom carrots her in season pick for March! Carrots have been cultivated for thousands of years—especially by migrating peoples, as they store and carry well over great distances. Carrots were not always the juicy, sweet vegetable we have come to know today. Early wild carrots were tiny, tough, bitter and spindly. They were not thought of as a food. Rather, they were primarily used for medicinal purposes. It was not until the 17th century that the Dutch developed today’s standard orange carrot in the Netherlands. The carrot is part of the same family as parsley. Other members include dill, caraway and celery. Carrots are chock full of pro-vitamin A carotenes, a nutrient essential for good vision. They are loaded with beta-carotene, which is why they appear orange in color. Carrots are a good source of thiamine, niacin, vitamin B6, folate and manganese, and a very good source of dietary fiber, vitamin C, vitamin K and potassium. Their powerful antioxidants help protect your body from cardiovascular disease and cancer—especially postmenopausal breast cancer. The only negative is that a large portion of carrots’ calories derives from sugar. There are several variety of heirloom carrots today. For brevity, I’ve featured my top three favorite tasting varietals that are commonly found in most local farmer’s markets across the country. 1. Cosmic Purple. 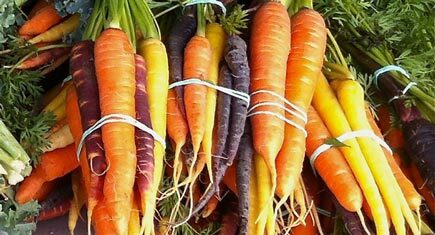 Purple on the outside and bright orange on the inside, these carrots are a real showstopper. They have a less sweet and almost nutty taste compared to the common carrot. 2. Bambina (Baby Orange) Carrot. Bambina is a baby-carrot variety with a slender, cylindrical blunt root and a very small core. They are very sweet tasting and have a crisp texture and a smooth skin (that I prefer not to peel). They are perfect for roasting. 3. Yellowstone or Yellow Carrots. These were first recorded in Turkey around the end of the 1st century. Yellowstone’s wide-shouldered roots, big tips and large tops have a crisp, clean, consistently mild flavor that’s great raw or cooked. Gourmets and chefs prefer this unusual heirloom carrot. How to Buy: Choose carrots that are firm, smooth and bright in color. Avoid carrots that are excessively cracked, dry, limp or rubbery. If the tops are attached, choose ones that are vibrantly green and crisp. How to Store: Immediately cut off the carrot greens. Even if you are going to use the greens later, cut them off and store them separately to keep them from sapping nutrients from the roots. Store the carrots in a covered container filled with water in your refrigerator for up to two weeks, but make sure you routinely change the water. This will keep them fresh for a long time. With most heirloom varieties, I recommend that you wash away the dirt and keep the peel on to preserve the most nutrients and taste. How to Use: My latest healthy snack obsession is Farm Shop LA’s Avocado Hummus with Pomegranate Seeds created by Chef Jeff Cerciello. Not only does it taste great, but it’s also packed full of powerful phytochemicals—you may just want double up and use it as a facial mask too! Chef Cerciello serves the dip in a shallow dish paired with Rustic Bakery flatbread. My low-carb healthy version is to pair it with three or so baby heirlooms. (Maybe one of each of the above?) Enjoy!